APSA is an official United States Practical Shooting Association Member. Practical shooting, also known as dynamic shooting or action shooting, is a shooting sport where competitors unite the principles of sportsmanship, precision, power and speed by using a full-sized firearm of at least 9mm caliber to score as many points as possible during the shortest amount of time. However, most of us don’t come to compete…we come to have fun! 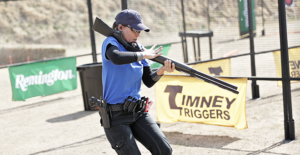 Learn more about the growing sport of Practical Shooting by visiting the USPSA website. Join us for our monthly USPSA matches. We meet at Triggers, Traps and Trout on the second Saturday of each month. Be at the range between 9-9:30am to set up. We hold a “Shooter’s Meeting” at 10am sharp and then begin to shoot. Matches are over by 3:30pm, then you can join us for a late lunch. Matches are $15 for members; $20 for non-members. Email one of our contacts before you come to make sure we will be shooting that day. New comers are welcome. See our schedule on the calendar. Visit our page directly by clicking here. Quickly create an account with Practiscore in order to register. See you on the range! Registration for matches opens up 1 week prior to each match. Women Arm Yourselves Safely – W.A.Y.S. W.A.Y.S. (formerly Women On Target) is an NRA sponsored training designed to create opportunities for women to learn all about firearms, and to gain confidence in newly acquired shooting skills. Learn safe firearms handling, how to store and clean your firearm and good shooting skills – you’ll learn a sport to enjoy for a lifetime! Click here to learn more about W.A.Y.S. View the calendar to see upcoming W.A.Y.S. classes. Class is only $35. Class space is kept small to give a more intimate feel and tends to fills up quickly. Reserve your space today. To register, download the form below and mail your $35 check payable to APSA. “Shoot” an email to the W.A.Y.S. coordinators Mike and Beth Privette (click for email) or call 828-966-9611 . They’ll be happy to answer your questions. Ready to take your shooting experience up a notch? Come join our quarterly 3-Gun matches! What is 3-Gun? Competitors use three different firearms — a modern sporting rifle (MSR), which is a rifle built on an AR-platform; a pistol; and shotgun. Matches generally involve courses where the shooter must move through different stages and engage targets in a variety of different positions. Each stage will generally require the use of different firearms and require the shooter to transition between them. Click here to learn more about 3-Gun competitions. Check out the calendar above for our match schedule. Bear Arms Indoor Shooting Range hosts our fun defensive shooting matches. Loosely based on USPDA and IDPA ,the match is designed to allow shooters to move around the range engaging multiple targets while being timed. Every week is a different course. Tuesday evenings at 6pm. Everyone is welcome. 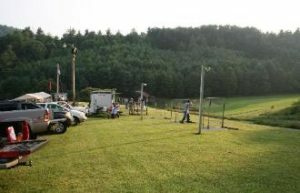 Triggers,Traps & Trout is located in Green Mountain, NC on a 140 acre “Century Farm”. The farm was founded in 1889 by L.L. Deyton, the great, great grandfather of the current owner, Ken Deyton.